I recently got one of the new Korg Wavedrum Mini units as I am a particular fan of electronic percussion instruments and thought I would do an unboxing and review of the item. Make Mine a Big One! And for those of you who come here for pure, unexpurgated comedy, here is my amazing performance using my nasal knocking device. Huzzah! 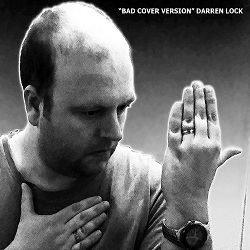 I’ve decided that the “Bad Cover Version” album/project is now complete. To celebrate this fact, I have recorded a podcat in which I talk through the tracks I’ve selected for this particular compilation. Tomorrow, I’ll post a page with the album in its entireity. Tracks include “Heroes” by David Bowie, “The Bucket” by Kings of Leon, “Who Knows Where the Time Goes?” by Fairport Convention, “Are Friends Electric?” by Tubeway Army, “Something to Do” by Adrian Belew, “Sabotage” by The Beastie Boys, “Willow’s Song” from The Wicker Man movie, “King’s Lead Hat” by Brian Eno, “Wannabe” by The Spice Girls, “Girl Like You” by Edwyn Collins, “Lucky Man” by The Verve, “Love Will Tear Us Apart” by Joy Division and “Sunrise” by Pulp. It has been a harrowing week, dear reader. I’ve spent every available spare moment working through my collection of 4-track master tapes. I have now finished this gargantuan task and have collated 9 hours of music, totalling 118 tracks. Some of these are complete songs, some of these are unfinished pieces, some are just fragments. It was hard work. Various versions of the same song, badly recorded bits, awful playing, improvisations that were borderline attacks in noise terror – I had to sit through it all in order to transfer this archive. Again, it made me realise how I’d documented my musical development. So it was a useful exercise in that way, but it was quite depressing. I don’t like looking back too often, I’m one of those folks who finds it hard looking through old photographs because I find it painful. However, it wasn’t all bad because I found a couple of tracks that were good and I’d completely forgotten about. The thing about music (if you are prolific) is that sometimes you completely forget you’ve recorded a track and so it is a genuine pleasant surprise to find something in the audio rubble. It is almost like someone else has recorded the song, but you hear flashes of yourself, your style, etc. So that makes it familiar, but it is still a stranger. I’ve made a long podcast detailing some of the more acceptable tracks – it is 1’30” in length so it is a long one but you get to hear me talking about stuff like mandolins, being hit by a car and other tales that inspired the songs, etc. Hey, it might even make you laugh (probably for all the wrong reasons). Of course, you can also get this directly off my podcast feed. Well it has been four years coming and now you can feast in the auditory delight of me speaking about various songs I’ve done in an attempt to engage and enthuse my audience with the last four sets of recordings I’ve released into the wild. The stories are faintly amusing, there’s a realistic sound effect of a firework going off and you have 1 hour 20 minutes of pure Lock action. It’s too good to miss. Download it today and send the link in an email to someone you don’t like. God Pays Debts Without Money…The PODCAST! 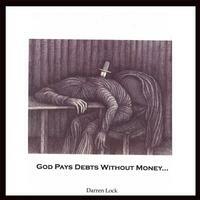 Filed Under: Podcasts by Darren — Comments Off on God Pays Debts Without Money…The PODCAST! So anyway, I got thinking about doing some promotional stuff for my new 4-CD set “God Pays Debts Without Money…” and the best I could come up with was to record a podcast talking about the collection and playing a few of the tracks. And so it came to pass and the podcast is just over 60 minutes in length and features a number of tracks from the collection. You can get the podcast by clicking this link. Or you can subscribe to my podcast feed, which is www.darrenlock.com/podcast.rss. Just cut and paste that into your newsfeed reader. Seeing as my previous attempt at a podcast had been a success of some kind (over 300 downloads), I thought I’d better crack on and pull out my finger to do another one. Yesterday, I completed the recording. This time around I am talking about recording a song called “Pearly King” and I explain how the whole song was recorded and constructed.